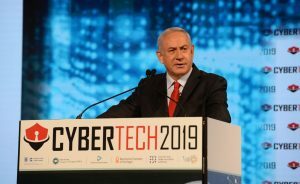 Premier Benjamin Netanyahu hield vandaag een toespraak tijdens de cybertech conferentie in Tel Aviv. Tijdens de conferentie onderstreepte de premier het belang van Israël’s cybertech voor de wereld. Ook maakte Netanyahu melding van het feit dat Iran dagelijks probeert Israëlische sites te hacken. De Iraanse aanvallen worden voorkomen door de grote kennis op het gebied van cybersecurity in de joodse staat. De cybertech conferentie wordt bijgewoond door 6.000 mensen uit circa 80 landen. Hieronder kunt u de hele (engelstalige) speech van premier Netanyahu nalezen. “Israel is a country that has undergone many transformations. A few decades ago the world was plagued by an incessant wave of attacks of airline hijackers. 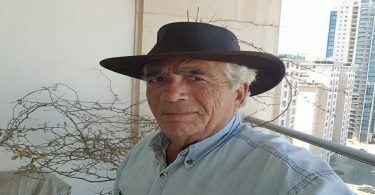 I remember that because I was on the team that forced our way disguised as airline mechanics into a Sabena airliner that was hijacked right here in Tel Aviv and we overcame the hijackers. To solve this problem we needed not only an active policy of attacking the attackers but also an active policy of defense. We put Israeli hi-tech to work and we developed a mechanical door with bolts and locks. That door was amazingly effective. 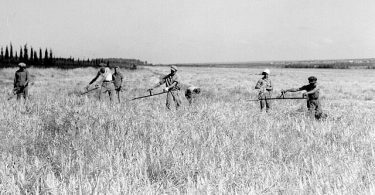 Because the combination of our policy of storming aircraft, even if they were far away, as far away as Uganda, together with defending the aircraft from allowing the hijackers to actually get to the pilots, basically made Israel immune to airline attack. And this success of course was followed by practically no one. Some countries did adopt airline security guards that we put in our planes but they didn’t really adopt this door until 9/11. And by March of 2002 every single American aircraft had these doors. Now we’re being attacked by different types of attacks and they require not mechanical doors but protection for virtual doors. Because our airlines can be attacked one hundred ways. They can be attacked by ground control interference, they can be attacked by the systems within the plane and the communications. It is in many ways right now the most vulnerable system that we have but as you know everything today is vulnerable and everything is under attack. Civil aviation is the one area that requires the most immediate, cyber defense solution but it is one of hundreds. So what we’re in the midst of right now is a change. The story of the Israeli door to Israeli cybersecurity for aircraft and many other things is a shift from the old world to the new world. Everybody else needs cyber. And here’s what happening to the Israeli cyber industry. It’s growing obviously in sales, it’s growing in terms of market share. In 2014 we were 10% of the market share of global private investment in cybersecurity. By 2017 it has doubled. That’s a very quick doubling. And it is now second to the United States. Israel is one-tenth of one percent of the world’s population and we are receiving 20% of the global share in private cybersecurity investments. That’s 200 times our weight in the world. What this revolution is doing, big data, AI and connectivity, is allowing small countries to be big countries. It depends on if you have the brains and the system to create conceptual products in an accelerated rate, conceptual products that are at the cutting edge and give you a competitive advantage. If you do this conceptual mousetrap the world definitely beats a path to your door. But this requires constant innovation. For that we have a machine that was forced on us. I decided several years ago, to turn Israel into one of the five cyber powers of the world and that required allowing this combination of military intelligence, academia and industry to converge in one place. And we’re doing that in Be’er Sheva. That’s where you should have this conference. In Be’er Sheva there is Ben-Gurion University. This is where we’re putting our military intelligence. We’re going to put even more of that. This is where you have the central command center for defending the country against cyberattacks and the cyber park of some of the leading cyber security powers and it’s all within 200 meters walking distance. We’re creating in Be’er Sheva now this complex that will encourage the same kind of development that we saw, that I saw in MIT and you may have seen in San Francisco. It’s already happening here in Tel Aviv. We’re just duplicating it there as a means of additional growth. What this means is that we have a sunk cost but it could develop into a business if we allow the graduates of our military units and our intelligence units to create companies. In order for the companies to develop, they need to make money. High taxes and regulation prevent them from making money. We have a problem with regulations. So the policy we have is keep taxes low and keep regulations low. Minimize regulations. There’s no industry more inviting to regulations than cyber security. It’s like weapons. It is a weapon. And therefore, we made a conscious decision to have this industry that is going to be the one of the three or four biggest industries in the world – cyber security, mobility, health and food. That’s it. In order for this to grow, we want to have a position in the world to continue. We have to make sure that we have economic partners that depend on our ability to merge the graduates of our security units into a business community, and this business community relies on partnerships. You are our partners. This is why we’re having this conference here. CyberTech reflects a policy and the fact that cyber security is going to grow exponentially. And it reflects the fact that what we have to do is to take certain risks and allow for the graduates of our security services to merge into companies with local partners and foreign partners. We have so much growth in this area that we cannot meet the personnel costs so we’ve done a program of cyber interns. Send people to be cyber interns with Israeli companies. I think you should visit this center. I am taking now foreign leaders to come and see this. They’re absolutely amazed. We have monitoring of attacks. Iran attacks Israel on a daily basis. We monitor these attacks. We see these attacks and we foil these attacks all the time. Iran threatens us in many other ways. They have issued in the last 24 hours threats that say that they’ll destroy us, they’ll target our cities with missiles. We’re not oblivious to these threats. They don’t impress us because we know what our power is both in defense and in offense. But the important thing is that any country can be attacked today with cyberattacks and every country needs the combination of a national cyber defense effort and a robust cyber security industry. And I think Israel has that and has that in ways that are in many ways unmatched. There is such a thing that I call today ‘cyber diplomacy’. If you want to see it reflected on the map, look at the blue. The blue are all the new agreements that we have made in various efforts around the world in the year 2017. I’ve been to Africa four times in two years, to South America, most recently in Brazil. With the great powers of Asia we have new agreements. Every single country here, every single country here with which Israel is expanding diplomatic horizons, is talking to us about cyber. They all want to share in our knowledge of cyber defense. This doesn’t mean that we share with everyone and it doesn’t mean that we share equally with those that we do share.